If the Fed were smart, it would have slashed interest rates to the bone this week, instead of dilly-dallying around. That way, everyone would know exactly where the economy stands (on the edge of a cliff) and what the Fed was doing about it. But that's not how things work. Instead, the high priests of finance like to "tinker" with the economy, and in my opinion, they do a lousy job of it. In the end, the Fed almost always ends up making matters worse. Tuesday's rate cut is a classic example. Presumably the Fed opted for a quarter-point cut instead of a half-point cut to send the signal that it does care about the value of the U.S. dollar. So, the dollar should have rallied strongly, right? Wrong! After the rate cut was announced, the dollar plunged against both the Japanese yen and the euro. Why? Because savvy traders know that the Fed is going to have to cut interest rates again, and again, and again. The Fed Is Causing Food Prices to Soar! Wheat has nearly tripled, to $9.42 per bushel. Corn has jumped more than 150% to $4.33 per bushel. Soybeans have almost doubled in price, soaring from $5.87 to $11.52 per bushel — a 34-year high. And now, even the prices of cocoa, coffee, palm oil, and rice are taking off to the upside. In fact, food prices are at their highest levels since 1845 — that's 162-year highs — according to the widely respected Economist magazine and its food-price index! The fundamental reason we've witnessed the dramatic surge in food prices is the same phenomenon I've been talking about for years now: The Federal Reserve's determination to devalue the U.S. dollar and inflate the economy! In large part, the weak dollar is why food prices are soaring. Wheat, corn, soybeans and even meat products are priced and traded in greenbacks, so when the dollar falls, the prices of these commodities typically rise in value. Stunning World Population Growth Is Creating an Insatiable Appetite for Food! We've already seen this dynamic in many other natural resources — oil, gold, silver, copper, uranium. Now we're seeing it in food products. And like other natural resources, the strongest demand for food is coming from Asia. Although it still maintains its one-child-per family policy in the cities, it's not illegal to have more children, provided the family effectively pays its own way for education and other social services. And with increasing household incomes in the urban areas, many more couples are opting to do just that. 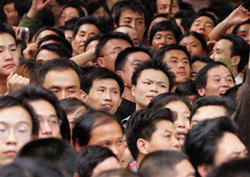 Result: As its overall fertility rate has risen, China expects its population to increase 300 million to 1.6 billion by 2050. That's the equivalent of adding the entire population of America! China's arable land is shrinking at the rate of 2.47 million acres a year. Construction is eating up land once used for growing crops. Aquifers have been dropping rapidly, reducing irrigation water supplies. Farmland, especially near urban centers, is being converted from grain production to higher value crops like fresh fruits and vegetables. Urban migration is depleting the countryside of able-bodied field workers. As the imbalance in supply and demand has become more pronounced, China has been turning to imports for its grain supplies. Booming populations are creating intense food demand in emerging markets! Meanwhile, much the same is happening in India, the world's second most populous country. Over the next 15 years, India's burgeoning population of one billion is expected to increase 30%. That's like adding another entire U.S. population! Plus, like China, India is also experiencing mass migration to urban centers like Mumbai, Calcutta, and Delhi. That means fewer farmers growing less food. By 2030, there will be another 1.4 billion MORE new mouths to feed from other corners of the globe. Sub-Saharan Africa is one of the demographic hotspots. The population there is going to explode from 642 million today to 1.4 billion in the next 25 years. Three Billion People Are Starting to Eat Meat! Not only are emerging markets' populations exploding, but their food habits are also quickly changing. According to the Rural Industries Research and Development Corporation, by 2020 demand for meat, poultry, and dairy products in 12 Asian countries — representing more than HALF the world's population — will soar as much as 55%! Beef consumption will increase by 50% ... pork 30% ... chicken 40% ... and dairy 55%. Already, since 1985, per capita consumption of animal protein calories in China has more than doubled, rising from 44 pounds to 110 pounds. Among developing economies around the world, demand for meat has shot higher, DOUBLING in just the last 20 years! It would be one thing if demand for meat was rising as demand for other foodstuffs such as seafood, grains, even rice, was falling. But that's not happening. Demand for ALL foods is rising across the board. Moreover, increased demand for meat puts additional upward pressure on grain prices. That's because it takes about two kilograms of feed grain to produce one kilogram of chicken. For pork, it takes three kilos of grain, and for beef, eight. All told, the anticipated rise in meat demand over the next 13 years will require as much as a 30% increase in global grain production to meet demand. Bottom line: A rapidly growing population translates into increased demand for food. Changing food habits are compounding the problem. And the falling dollar is like gasoline on the fire. And my various technical indicators agree with the fundamentals, showing that grain prices could more than double AGAIN in the next two years. 1. PowerShares Agriculture Fund (DBA) — Consider purchasing this exchange-traded fund or a similar ETF devoted to tracking the prices of the major food groups, especially grains. This particular fund allows you to effectively invest in agricultural commodities, but without having to go into the futures or options markets. 2. Sadia S.A. (SDA) — a Brazilian food producer with operations in Brazil, Argentina, Chile, Uruguay, Paraguay, and Bolivia. It is one of the largest food companies in the region. Half of its sales come from outside of South America, with Asia and the Middle East particularly large buyers. 3. Archer Daniels Midland (ADM) — an agribusiness giant that grows and processes corn, wheat, soybeans, barley, and other foods. A major player in the industry. 4. Cresud Inc. (CRESY) — An Argentina-based grower of wheat, corn, and soybeans. Cresud also raises beef and dairy cattle. You should do your own research before you invest in any of these. But as I just showed you, the overall trend of rising food prices looks clear as day, and natural resource investors should not ignore it! P.S. If you want specific buy and sell instructions covering all the natural resource sectors, including follow-ups and flash alerts, subscribe to Real Wealth Report .